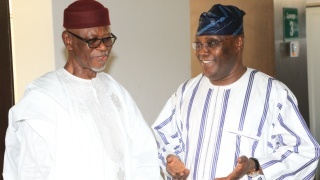 Former Vice President Atiku Abubakar and the Adamawa State Governor, Jibrilla Bindow are locked in a closed door meeting with the National Chairman of the All Progressives Congress, Chief John Odigie-Oyegun. Others at the meeting are the Deputy National Chairman (North), Sen.Lawali Shuaibu, National Secretary, Mai Mala Buni, National Vice Chairman (South East) Emma Eneoukwu and the National Tresurer. Although the subject of the secret meeting was not disclosed, sources said that apart from discussing issues concerning the replacement of some members of the National Working Committee who were appointed to government positions, the meeting also delved into how to create harmony amongst leaders of the party ahead of the 2019. Atiku, who entered the national secretariat of APC around 12:50pm unannounced, in the company of Adamawa state governor Muhammad Bindow Jibrila, walked straight to the office of Oyegun. Both the Oyegun and his guest were however, locked in a closed door meeting for about 20 minutes before the they allowed other national officers to join them inthe meeting. Atiku who came with his media team however, failed to speak to Jouralists as two NWC members pleaded with him not to do so.